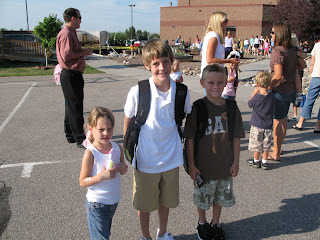 This was taken on the first day of school. In front of Pine Grove Elementary. Blake was excited to be back at school with his buddies and new Teacher, Mrs. Lucus. He seemed so mature as he headed into the fourth grade. Tanner was all smiles as he was thinking mostly about how fun recess would be and a little concerned about what first grade would be like. Even though I saw it with my own eyes, I cannot believe how big your kids are getting--especially Blakester! I hate how all our kids are leaving us all day long. The baby time with them went by way too fast! i love the picture. they look so happy going to school.